Over the past several years, our Conservation@Home program has helped more than 700 property owners turn their patches of earth, big or small, into water-conserving havens for wildlife, bursting with beauty and working to keep nature in balance. But some of the largest landholders around are businesses, schools and churches whose properties offer a tremendous opportunity to impact water quality and wildlife in the region. Through Conservation@Work we educate business owners and organizational leaders on the benefits of native plants, ways to conserve the rainwater that falls on their land, proper management of invasive species, and how to reduce chemical use and watering. These practices not only help preserve and restore our natural environment, but they can drastically reduce maintenance costs while providing shelter for beneficial wildlife and beautiful outdoor spaces to enhance employee and customer satisfaction. 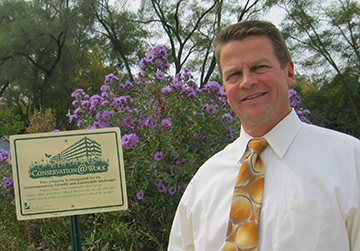 Those who employ these principles can earn Conservation@Work certification, receive a sign recognizing their efforts and one-on-one advice about ways to make an even more positive environmental impact on their property. There is a one-time fee of $300 for certification, which includes a one-year membership to The Conservation Foundation. Click here to see the Conservation@Work brochure. Property must have some native plant components, for the benefit of water conservation and wildlife. There should be clear evidence of stewardship of the land (invasive species control). Water on the site should be managed effectively to reduce runoff. Reduced use of chemicals, including salt, is recommended. Go Native! The use of native plants is key to any environmentally friendly landscape. The deep roots of native plants reach far down into the ground, firmly rooting soil and reducing erosion, and also absorbing rain where it falls to carry it back down to our groundwater supply, filtering it as it goes. Save Every Drop! Why spend money and drinkable water on irrigation efforts when what you need literally falls from the sky? Rain barrels and larger scale rainwater harvesting can capture the rainwater that falls on your property so you can put it to use and keep it from running off, collecting pollutants as it goes and carrying them into our rivers and streams. Cut Back on Chemicals. Work to reduce or eliminate the use of fertilizers, weed treatments, salt and other chemicals, which are harmful to birds, butterflies and other two and four-legged visitors, and also to fish and aquatic life when they reach our waterways. Wage War on Invasives! Non-native species compete with and often choke out more beneficial and well adapted native species. Unleash any workplace stress on the nearest garlic mustard, buckthorn or honeysuckle! Give Us a Call. We'd love to come take a peek at the ways you are working to conserve water and invite nature in to your business, school or church, offer some tips on what you can do to have an even greater environmental impact, and give you some recognition for your efforts. Contact Jim Kleinwachter at 630-428-4500, Ext. 115 or email him to schedule your site visit!